🏆 GIGA-BYTE Technology Co., Ltd.
VUZIX Blade AR smart glasses allow you to do just that. 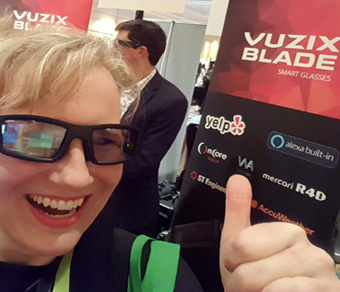 Disclosure of Material Connection: YBLTV Publisher, Erika Blackwell, received a VUZIX Blade from VUZIX Corporation in consideration for a Product Review. What if I told you, you could make a phone call with the touch of your finger? 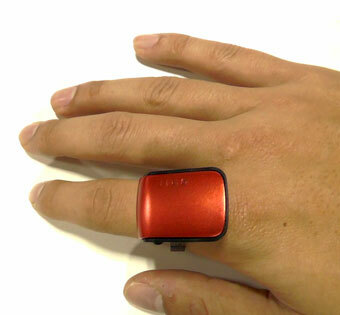 This is ORII, the voice powered smart ring that lets makes phone calls simply by touching your index finger to your ear. 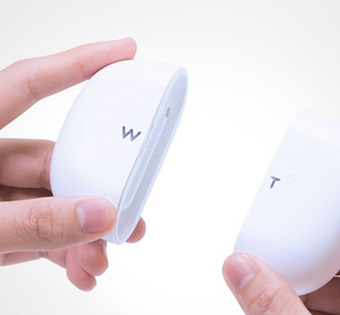 This innovation brings phone calls to a whole knew level. Crisp and clear audio anywhere on the go, ORII comes equipped with instant messaging, quick call, voice assistant and custom notifications. Can a phone call get any better than this? Small earbuds that resemble the Apple AirPods are not designed for music but rather allow two people who speak different languages to understand and hold full conversations with the aid of this simple device. If you travel a lot and/or have difficulty with other languages you owe it to yourself to check out the companies kickstarter page to purchase a pair yourself. Disclosure of Material Connection: YBLTV Writer / Reviewer / Anchor, Jack X, received WT2 Real-Time Wearable Translator from Timekettle in consideration for a Product Review. Harley-Davidson Motor Company unveiled Project LiveWire at CES 2019. I had the chance to see the motorcycle in person as well as hop on the seat itself. Harley-Davidson has made history in the past and this motorcycle will be history making as well. 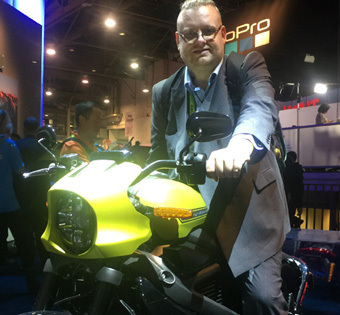 The company will release this first full electric motorcycle available on the market later this year. 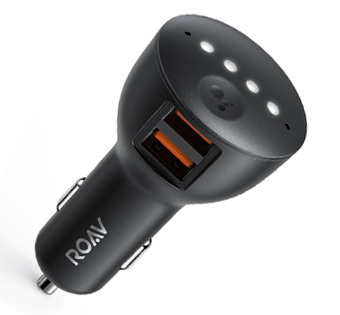 Following the release of last year’s Roav Viva – a smart car charger featuring Amazon’s Alexa – Anker Innovations announced at CES 2019 that a new car charger would be coming to market in the upcoming weeks. The Roav Bolt finds its intelligence powered via Google Assistant, with the battery-charging capabilities staying true to Anker’s long-running history of affordable, high-quality power accessories. Following my review of the Roav Viva last year, I found several areas that could have been improved on for an upcoming model, such as size of the unit, utilizing the smart assistant already integrated on a large number of smartphone operating system, and slightly faster charging. 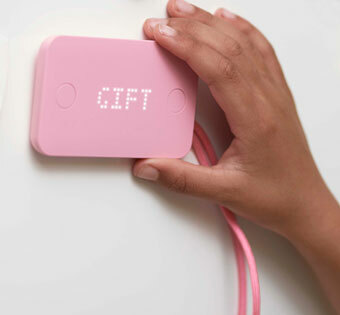 The Roav Bolt is poised to address these concerns by allowing users to expand their existing Google ecosystem beyond their home – the inclusion of Google Assistant speaks to Android users and allows a driver to, among other functions, execute a larger number of commands, including mobile orders and daily updates via Google Maps. Additionally, the size reduction of the Roav Bolt itself is very appealing, especially for those with cigarette lighters in awkward or tight places. If you are like me and have integrated yourself squarely into Google’s ecosystem, or if you’re searching for an attractive, two-port car charger with the power to back it up, your search may be over. Now available for pre-order at goroav.com for $49.99 USD. 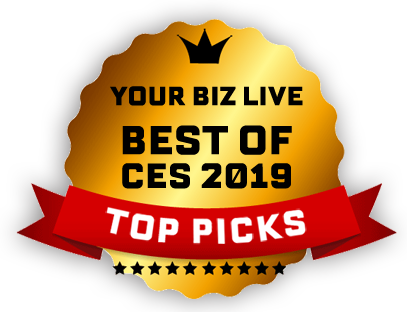 GIGA-BYTE Technology Co., Ltd.: one of the few exhibits that I saw doing something different at CES 2019. 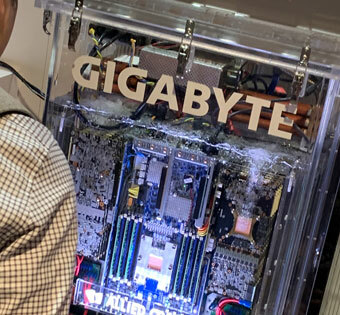 Gigabyte had its liquid cooling system on display at this year’s CES and I was amazed at its structure. The components / peripherals are housed in Gigabyte’s two-phase liquid immersion cooling system, allowing the system to remain cool throughout use. The technology might seem confusing to some but for those who know or have heard of the liquid cooling system, this may be the best way to cool your computer. 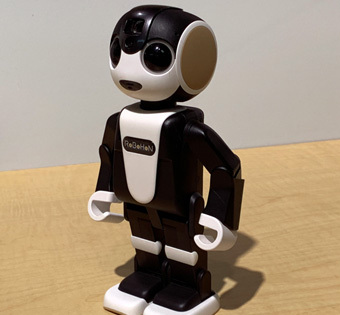 RoBoHon: Sharp’s Mobile communication robot was a surprise to see at CES 2019. It recognizes you and begins to communicate in ways that will blow you away. The most incredible thing about RoBoHon is that it’s a phone as well. I was amazed with the product and enjoyed talking to the tiny robot, while watching it dance, communicate through jokes and just simply entertain. I didn’t get a chance to try out the phone features but the robot itself was a joy to interact with and can become the next best thing in communication. Modeled after seats used in motorsports, Arozzi Vernazza is definitely the most comfortable chair I have used. The comfortable style of the full line of chairs by the company is why the booth at CES 2019 turned from chair central to nap central. If you sit for long periods of time when working like I do, then you owe it to your back to pick up a gaming chair from Arozzi. 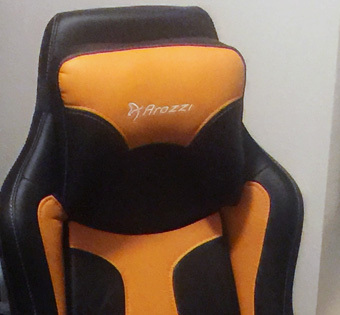 Disclosure of Material Connection: YBLTV Writer / Reviewer / Anchor, Jack X, received an Arozzi Vernazza Gaming Chair from Arozzi in consideration for a Product Review. 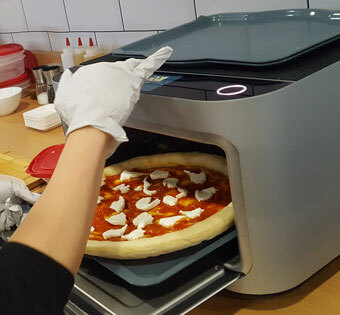 Get busy toasting, baking and reheating with Brava’s countertop oven this year! Brava’s Pure Light Cooking™ technology gives you faster, more precise cooking unlike a typical convection oven. 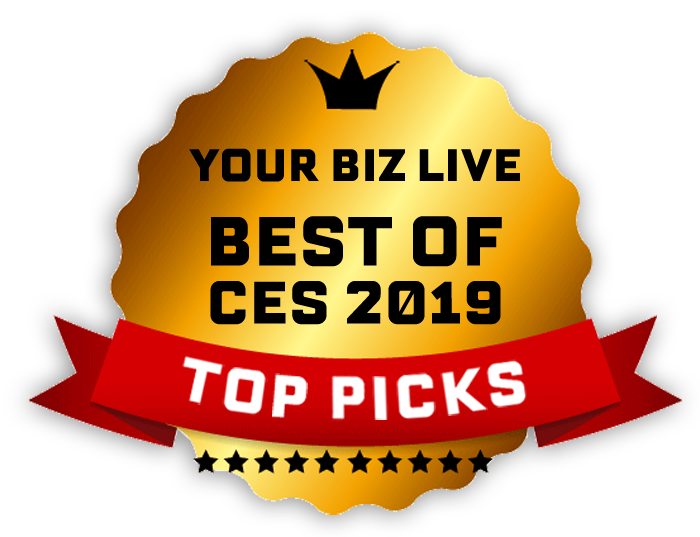 The first oven to truly sear, YBLTV loved the seared samples the Brava team was handing out at CES 2019 – salmon, vegetables and steak… And the pizza was quite tasty too! What a better way to start the New Year than with a little Pepper! For the millions of Americans who are struggling with chronic diseases, following a healthy diet is key. No need to calculate what you eat – Pepper is your smart home friend who helps you log your meal history and track your nutrition. 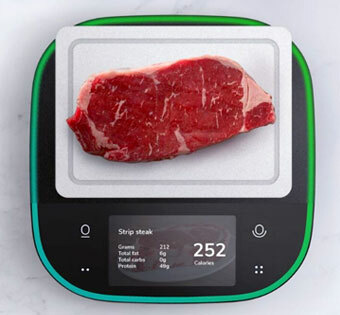 Coming soon to Kickstarter, Pepper is a connected cooking and nutrition platform, guiding you through all your favorite recipes with voice and video. Get in shape and eat healthy…with Pepper. Modi: The built it, even a child can do it, at home engineer kit. 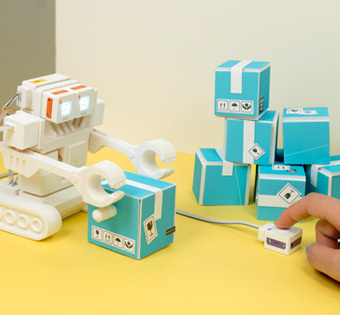 Magnetic modules that will allow you to build anything from a walking robot, to a motion sensor, to a smart home controller in the palm of your hand. An engineering kit originally designed to teach children the functions of the input, output, and setup modules as well as the basics of programming functions connected to the modules. 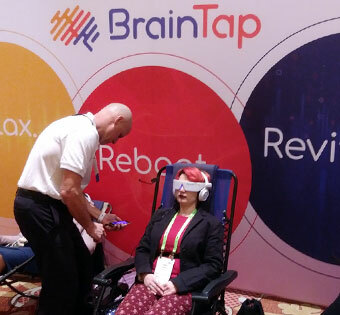 BrainTap: Ever had a difficult time falling asleep? Do you get depressed or anxious and have a difficult time relaxing? Enjoy meditation, but can’t seem to sit still long enough? Well if you are anything like me, you agree to one or all of these things. Welcome to BrainTap Pro, the app with guided meditation for any occasion. Just click on your meditation of choice and let the app do the rest. I for one prefer the stress-free, and sleep -well meditations. Honda P.A.T.H Bot: Major companies such as Honda have decided to begin building robots that may be incorporated in everyday life and businesses. 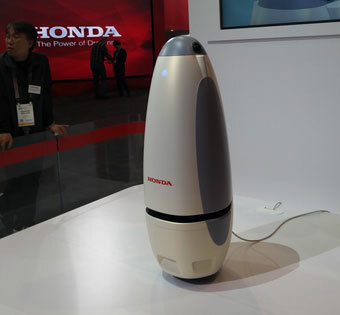 Meet Honda’s P.A.T.H bot, a robot designed to ease the tension of robot fear to humans by its appearances and Its ability to evade incoming humans/objects coming towards it. P.A.T.H bot’s future design may include anything from a help bot to security bots and anything in between. I for one am excited to be a part of the robot integration generation. 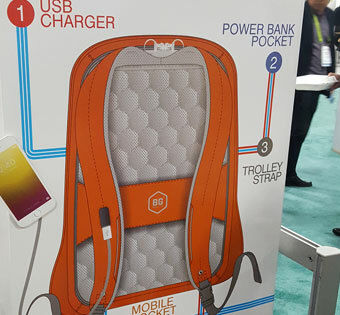 Looking for an AWESOME backpack to carry all your stuff? Look no further than Benga International GmbH’s MetroBag: the anti-theft and RFID Protection Backpack. I was very impressed at all of its many storage compartments with unique places to store your laptop, wallet, tablet and any other electronic gadgets. Velcro fastening helps organize your cables. Easily locate your house keys and pens. A zip storage pocket is perfect for loose items. Keep your phone charged with a USB charging port. A hidden mobile pocket and a hidden shield pocket for magnetic cards are easily accessible and offer the RFID protection system. Made with dragon polyester, MetroBag measures H49 x W36 x D15 cm. Available in gorgeous colors – black, light blue, grey, olive, mustard, burgundy, dark grey and navy blue – day or night, you’ll look slim and sleek with MetroBag!